Buffdaddy Nerf: Nerf Concept Compendium! Nearly every air blaster at its core has a handheld air pump with check valve, a firing chamber (colloquially referred to as a "tank"), and a valve to open said chamber to the barrel when the trigger is pulled. In some cases, on-board air storage is made possible either through an air tank or an expanding rubber bladder - the former can hold far more air than a similarly sized bladder, but the latter is capable of supplying more consistent pressures to the firing chamber. 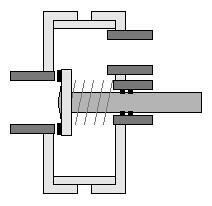 When the valve on the firing chamber is opened, the compressed air within rushes through the outlet toward the atmosphere, applying force to the surfaces along its path until the air pressure reaches equilibrium. In the case of air blasters, we place a movable object (a foam dart) in the escaping air's path, and the force applied by the compressed air drives the dart down the barrel and on toward the target. Because there is no need to build pressure upon firing, the best barrel setup for air blasters is any barrel that allows darts to easily slide through when you blow on the barrel. There should be enough friction to keep the dart from moving on its own, but no more than that. This also helps prevent air from going past the dart in the barrel and degrading the performance of your shots. By far the most common method of charging the chamber of an air blaster is through the use of a simple pump. Generally speaking, pumps work by using a rubber o-ring to seal off the pump tube during the compression stroke. As the pump is pushed in, the compressed air escapes through the check valve at the rear of the pump tube - check valves are needed in order to ensure that the air is only traveling one way (into the chamber) and can't escape back through the pump tube. On the outward stroke, the o-ring moves slightly forward within its groove (it "floats"), opening an air pathway. This fills the tube with more outside air for the next compression stroke. Some pumps will, instead of using a floating o-ring, have a second check valve at the base of the tube. This check valve will allow outside air to enter the tube on the outward stroke to relieve the vacuum that the motion would otherwise produce. These types of pumps are most often seen in Super Soakers and other water blasters; the use of liquid in the system instead of gas allows for the greatest effect - when such pumps are used for air, the compressible nature (or conversely, decompression) of the air does not immediately produce a near-vacuum pressure, causing the second check valve to activate later than desired and for a shorter duration. The end result is a less efficient pump. In general, the closer the second check valve sits to the pump tube, the better this version of pump will operate. As a safety feature, most pumps used in air blasters have overpressure valves - spring loaded check valves designed to open at a set pressure. Usually located within the pump head, these devices prevent injury to the target by prohibiting dangerously high pressures in the chamber, and also to the user by preventing pressures high enough to compromise the system. 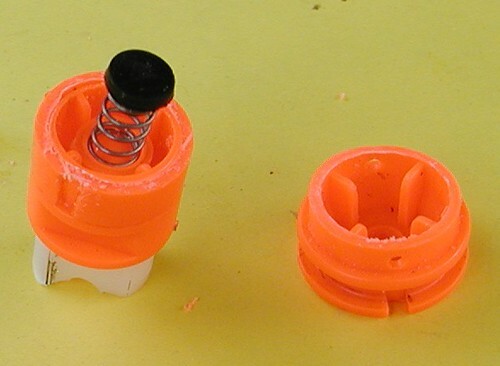 If a chamber ruptures from excess pressure, the rapid decompression can result in plastic shrapnel that could seriously injure the user of the blaster. While these relief valves can be placed anywhere in the system, they are most effective at the pump head or near the pump's air outlet. 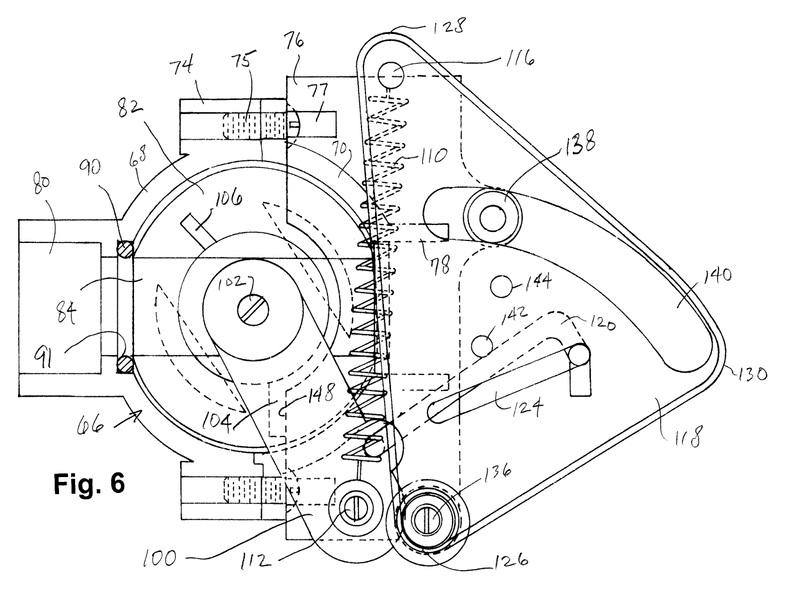 This allows the valve to operate as soon as excess pressures form without any chance of sticking; the excess air can be vented quickly from the system before the internal system pressure equalizes. ORPVs are a requirement for use in ANY homemade air blaster, alongside a pressure gauge for showing the maximum pressure of the blaster. One commonly used relief valve comes from McMaster-Carr, and can be adjusted for a wide range of desired pressures. In rare cases, ORPVs are not needed do to the design of the blaster. For example, in Marshmallow Blasters, the pump head cannot travel down the pump tube completely, leaving an area of dead space. The volume of dead space in the pump determines the maximum pressure that can go into the chamber; further pumping beyond this point becomes futile, and the user is prevented from achieving absurd pressures. Air compressors are very uncommon in the Nerf community due to expense, weight, and overall practicality. Smaller air compressors with acceptable automatic shutoff pressures are available, but still require the user to carry a power source (batteries) for operation. This extra weight is cumbersome. You will likely only see compressors used with homemade cannons designed to fire large numbers of regular darts, or rocket and arrow darts. One exception is the Marshmallow Mazooka, which has a tiny compressor driven by 6 AA batteries. However, it is very noisy and eats through batteries at a fast rate. There are several kinds of valves that are used to open the chamber to the dart barrel. They all have their uses. Pin valves are perhaps the most common type to be found in air blasters, as well as most Super Soakers up to the end of the CPS era. A disc with a rubber sealing surface (disc, o-ring, etc) seals off the air outlet of the chamber and is held in place by a weak spring (this ensures an airtight seal before you start pumping). A metal or plastic rod is attached to this piece, and runs to the outside of the chamber for connection to the trigger. O-rings are used to seal off the pin hole to prevent leakage. Note that it IS possible to use the pin itself to seal off the barrel - you'll just need to have o-rings sealing off both ends of the chamber, and use a larger rod to allow sufficient output. Since the air in the chamber is pressing only the outside of the pin and not against any sealing surface, the forces cancel out. Thus why this version is called the Zero Pull Valve. This type of valve is seen in most homemade air blasters. Classic garden nozzles are pin valves that are easily available almost everywhere. PVC check valves can also be converted into pin valves when placed in reverse and given an extended pin for actuation. 3DBBQ's JSPB - The Mad Ghost effectively uses this type of valve. Also known as backpressure valves, these are a method of controlling the air release via a floating piston within the chamber. The piston is pushed forward when the chamber is pressurized, sealing off the outlet. However, it seals against a raised surface, NOT a flat one. This allows the air to exert some force in the opposite direction. More on that later. When the trigger is actuated, a pilot valve is opened, allowing the air within the tubing behind the piston ("pilot volume") to vent. If you vent the air quickly, then the sum of the forces acting on the piston changes - there is more area on the FRONT of the piston for exerting force than in the rear because of that raised surface. 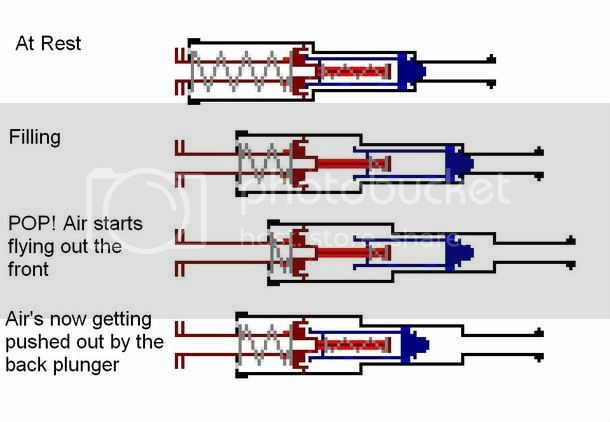 Once the piston starts moving back, the entire front of the piston is exposed to the compressed air, snapping the piston back and dumping the rest of the air down the barrel. 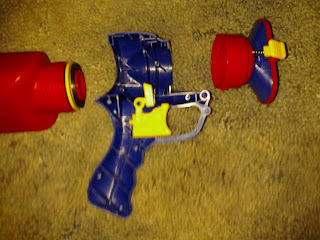 Nerf blasters like the Hornet and Secret Strike Pocket Blaster (SSPB) use these types of valves, but they are seen far more often in off-brand blasters like the Lanard Big Salvo and Sonic Bazooka, as well as Buzz Bee's entire Extreme Air Max line for 2013. This valve is also popular among spud cannon enthusiasts. Spudfiles has several good explanations, including Flash animations like the one below. A less common design that is often seen in Marshmallow Blasters and the like. 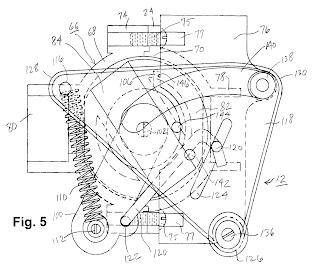 The valve consists of a check valve with some outside mechanism that keeps it closed until the trigger is pulled. In most cases, there is a plastic catch-piece (properly known as the "seer", to borrow firearm terminology) connected to the trigger. Several types of check valve can be used - disc, swing, etc. - as long as they can be held in place against the pressure of the air chamber. This type of valve is most often seen in spud cannons, where sprinkler valves have been converted to just use air pressure. When charged, a rubber diaphragm seals off the barrel. Dumping the air on the opposite side of the diaphragm causes it to quickly contract, opening the air outlet. In essence, sprinkler and piston valves operate the same way. Sprinkler valves are just built differently. Another valve used in homemades, as well as many Super Soakers since the beginning of the Max-D product line. A ball with a port through it sit within a rubber seat, making for an airtight seal. The ball is connected to a handle or arm of some kind, allowing the user to turn the ball to open and close the valve. While reliable, ball valves are slow to fully open and normally not ideal for air blaster use. 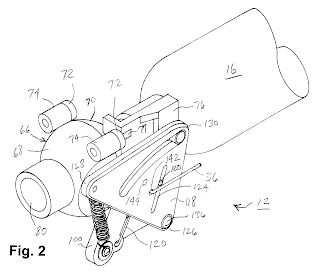 In 2001, Larami filed for a patent for a "snap action ball valve assembly" to be used with water blasters. 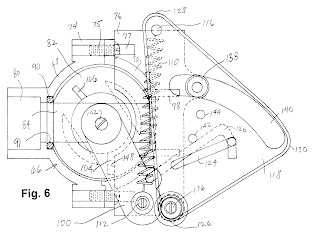 In what we now call the Max-D ball valve, a series of spring loaded levers are connected to the valve and the trigger. 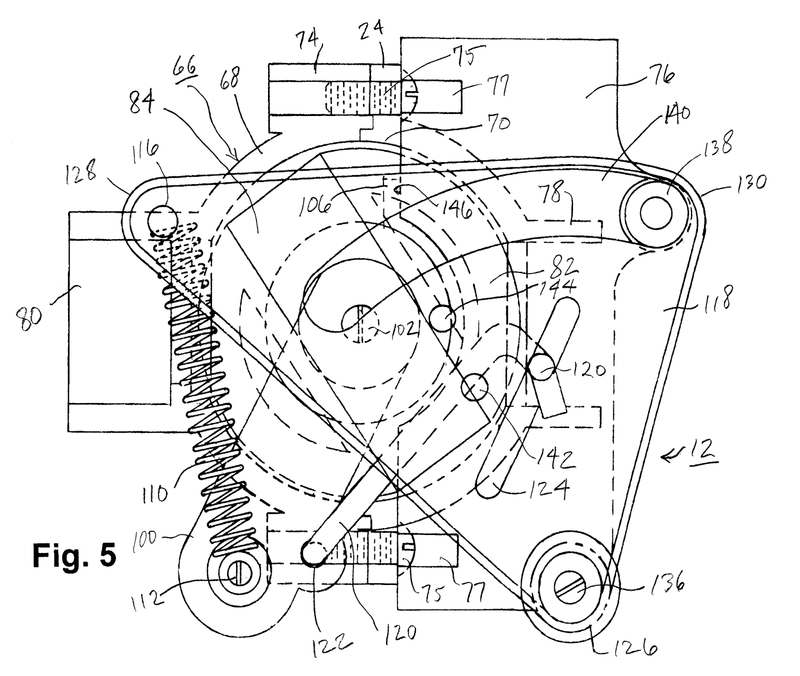 After the first lever rotates far enough, the attached spring pulls the valve arm to the open position in a faster, more fluid motion. 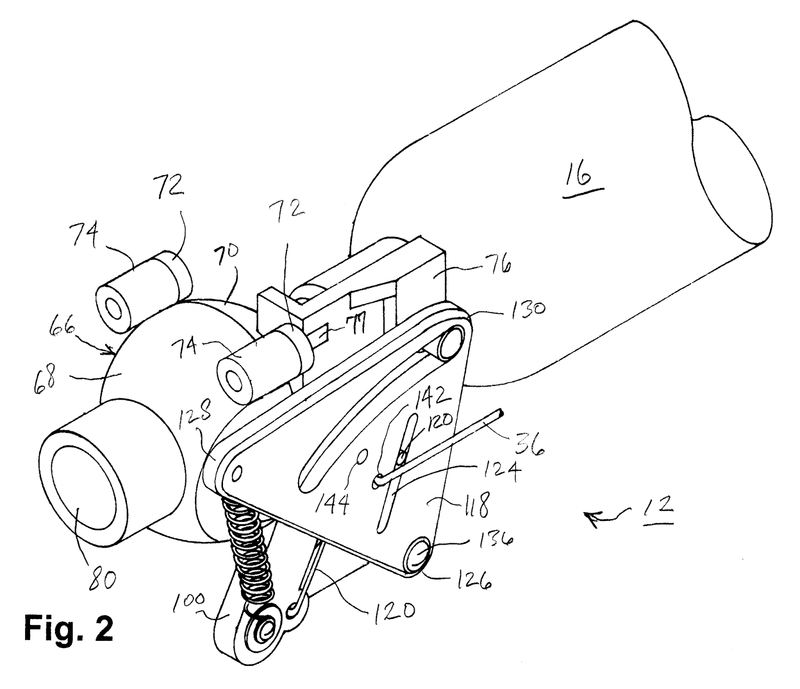 Physically, it's the same principle used in the Air Tech pin valves - the trigger compresses a spring, which is in turn mounted on the pin, until enough force is applied to open the valve. At that point, the potential energy stored in the spring snaps the pin back for more consistent performance. Once the triangular lever is nearly all the way back, the extension spring pulls the valve arm through its full motion in one swift movement. It should be noted, though, that the external assembly can fail over time due to stress. There are many types of valves not covered in this essay. For example, the Magstrike and Rapidfire 20 both operate using a rubber bladder for air storage and a moving piston that fires as well as advances the clip or turret. These are a variation of spool valves that are often used in paintball guns. Another paintball device, the hammer/valve assembly, is sometimes seen in less common blasters like the Light Storm series.